in the auction description, I'm inclined to doubt that this includes Ringo's version of "Love Me Do". Here is a truly incredible Beatles rarity, an ORIGINAL UK acetate of their 1963 debut album "Please Please Me" with two big differences. First, "I Saw Her Standing There" is here listed with it's original title "17." In Mark Lewisohn's definitive reference book "The Beatles Complete Recording Sessions" the entry for the Monday, Februrary 11 1963 session notes that "17" was "the working title of "I Saw Her Standing There"." The song was recorded at this recording date along with most of this album. Lewisohn says of this session "there can scarcely have been 585 more productive minutes in the history of recorded music." Also unique in this case is the version of "Love Me Do," which is the version with Ringo on drums. As you may recall, the band originally recorded what would become their first single on September 4, 1962. Either George Martin or Paul McCartney felt Ringo's drumming wasn't working, and so they re-recorded the song on September 11 with session drummer Andy White. While the "Ringo" version was used on the original single release, the "Andy White" version appeared on the "Please Please Me" album and all singles and EP's pressed after 1963 (in fact, according to Lewisohn, "it was decided that all future pressings of "Love Me Do" should have (the Andy White) take. To ensure this, the master tape of Ringo's version was destroyed." 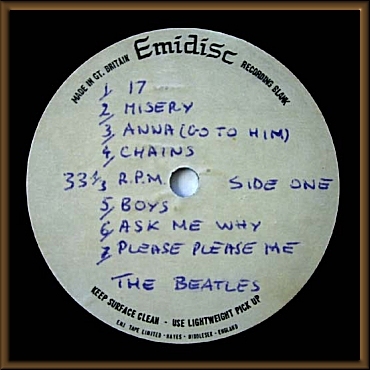 This acetate features the "Ringo" version, which is unique for a copy of this album. 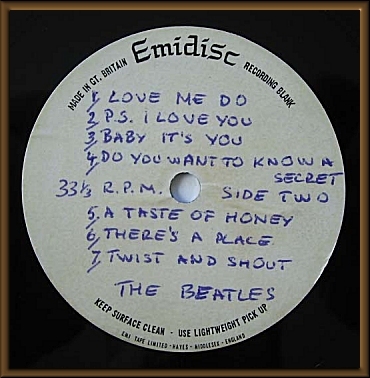 This mono acetate would have been cut at EMI on or about February 25, 1963, the day the album was mastered. According to the Lewisohn book, at this point "17" was still the working title of "I Saw Her Standing There." We know of no other copy of this acetate. 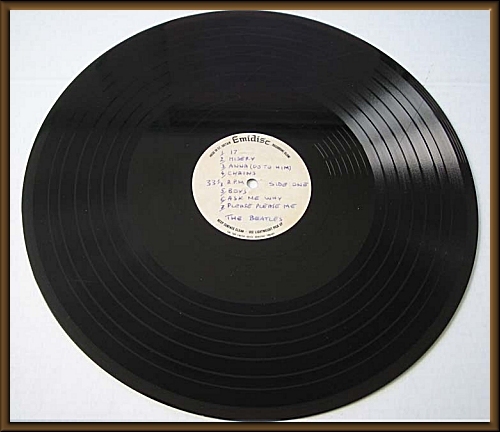 Ken Scott, the legendary record producer and Beatles engineer told me the following about Beatles acetates: "Back in those days there were no cassettes, DATs or CDs and so the main way for artists and producers to be able to listen to something at home was through playback acetates. The number required varied. As did the persons receiving them. It could be producer, artist, arranger, publisher, DJ or sometimes even a promotion guy." While this grades visually G, it plays VG+ with some light surface noise and the odd tick or pop, but no skips/jumps. I have digitally transferred this acetate and will include a CDR of the music with the acetate. As this pre-dates the mega-collectible "Gold Parlophone" first pressing of "Please Please Me" (the first Beatles album issued anywhere in the world,) we can accurately call this the earliest version of a Beatles album anywhere in the world. And of course, as with everything we sell, this is guaranteed for life to be absolutely authentic.